Nautical Flags-Charleston Embroidery Patch measures 3-1/2" x 1-1/2" inches. 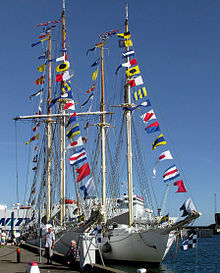 International maritime signal flags refers to various flags used to communicate with ships. The principal system of flags and associated codes is the International Code of Signals. Various navies have flag systems with additional flags and codes, and other flags are used in special uses, or have historical significance. A series of flags can spell out a message, each flag representing a letter. Individual flags have specific and standard meanings; for example, diving support vessels raise the "A" flag indicating their inability to move from their current location because they have a diver underwater and to warn other vessels to keep clear to avoid endangering the diver(s) with their propellers. One or more flags form a code word whose meaning can be looked up in a code book held by both parties. An example is the Popham numeric code used at the Battle of Trafalgar. In yacht racing and dinghy racing, flags have other meanings; for example, the P flag is used as the "preparatory" flag to indicate an imminent start, and the S flag means "shortened course"